Samsung SDS has given its approval for partnering with Mahindra, which is an IT giant based in India. The partnership, in particular, is all about entering the massive overseas blockchain market. SDS is, by essence, Samsung’s systems integration arm. Through it, the Korean tech giant can easily expand the utilization of its Nexledger blockchain platform in countries like Europe, India, and the United States. The partnership of the two firms will help them both seek more business opportunities in the country. Even more so, Samsung SDS is expected to support Mahindra when it comes to updates relating to Nexledger. The latter is a blochain security platform launched by Samsung back in 2017. According to a report from Binance Research, Bitcoin prices – including those from altcoins – can potentially hit even their lowest point. Binance’s dedicated research analytics arm investigated a handful of trends and phenomena, all of which are directly related to digital currencies. Apparently, among these is an apparent correlation between the world’s leading crypto and altcoin prices. As per the data circling 2014 to 2019, the 90 days towards the middle of March confirmed to be the highest correlation in the market history. As far as historical behavior is concerned, this has the potential to trigger trend reversals. The aforementioned timeline showcase a drop of Bitcoin’s price, which was from $6,500 to $3,100. According to Binance Research, there is a possibility for markets to rebound now after the end of the record correlation period. The NPCI or National Payments Corporation of India is strongly considering the idea of using blockchain when it comes to digital transactions. It believes that by doing so, it can significantly strengthen these transactions. The initiative, which is being spearheaded by at least 10 banks, is an attempt to boost the NPCI by simply deploying distributed ledger tech. The NPCI is basically an umbrella organization that focuses on retail payments. It is also in charge of settlement systems present in the country and, more importantly, offer around 56 national banks as stakeholders. 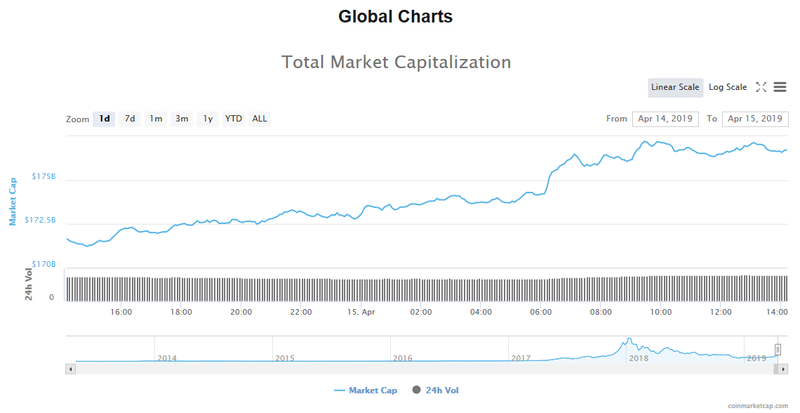 According to data in the past 24 hours, the crypto space has witnessed a volume of trade $38.22 billion. As far as the market capitalization is concerned, it highlighted a figure of $176.69 billion. Bitcoin continues to be a leading crypto in the space, especially since it jumped 2.42% for a price of $5,185.31. As for its trade volume and market cap, it featured $10.89 billion and $91.50 billion, respectively. While Ethereum continues to be next to BTC, it is also showcasing a good run in the space after a 3.16% jump. Its trade volume is $5.06, while its market capitalization is $17.78. As for the altcoin’s price, it is reportedly $168.27. All digital currencies in the space showed a promising leap, although Tether went the other way around. As for the 10th spot, TRON was finally dethroned by Cardano. Bitcoin’s market price jumped 2.42% to $5,185.31, and its value in the market is $50 billion. Ethereum’s market price jumped 3.16% to $168.27, and the market value is $17.78 billion. 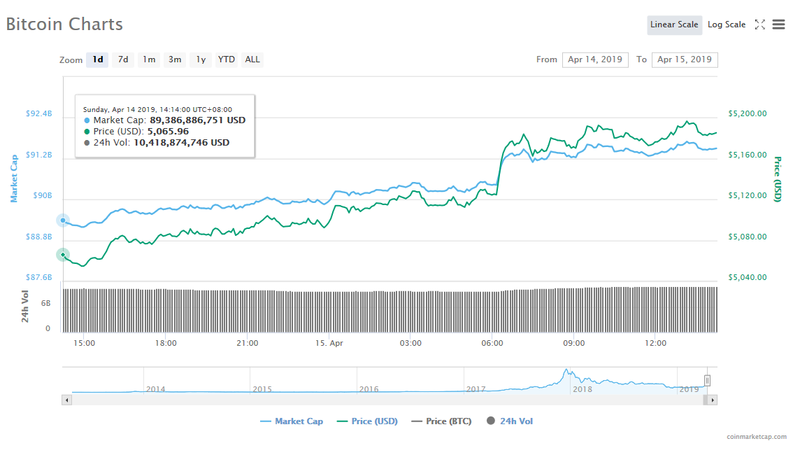 XRP’s market price jumped 1.03% to $328874, and its value in the market is $13.74 billion. Bitcoin Cash’s also took a leap at 8.96% to receive $300.49 in price, and its value in the market is 5.33 billion. Litecoin’s market price jumped 7.87% to $83.32, and its value in the market is $5.11 billion. EOS’s market price jumped at 5.54% to $5.58, and the confirmed value in the market is $5.06 billion. Binance Coin’s price in the market jumped 3.44% to $19.47, and its value in the market is $2.78 billion. Tether’s market price fell 0.10% to $1.01, and its value in the market is $2.43 billion. Stellar’s market price jumped 3.35% to $118301, and its value in the market is $2.28 billion. Cardano grabbed the 10th spot and dethroned TRON after jumping 3.56%, resulting to a trade price of $0.085026. For its market value, it went $2.20 billion. According to two newly published patent applications in the US Patent and Trademark Office (USPTO), Walmart may be planning to store its payments data on Blockchain based technology. The patents focus on the use of Blockchain technology to secure payments information so that it is not accessible to unauthorized parties. 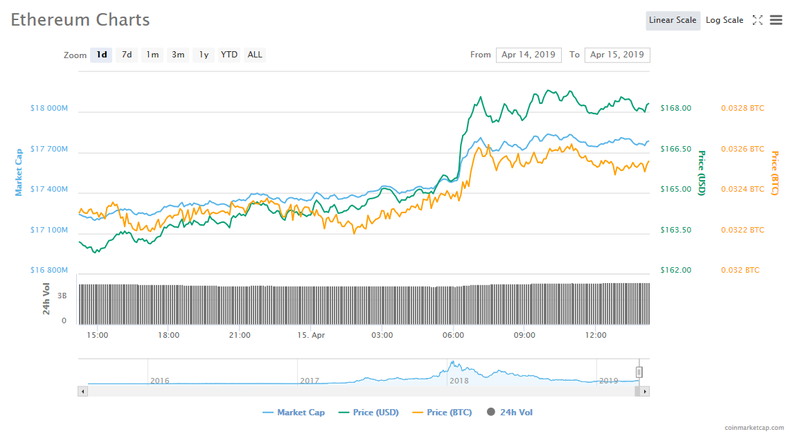 In a blog post published on April 17, Tether announced that it has launched its stablecoin USDT on Tron’s Blockchain. Tether stated that this development meant that the stablecoin had upgraded from its previous OMNI based protocol, which was anchored to the US dollar on a 1:1 ratio. In breaking news, Google announced that it was going to change its financial products policies from June of this year. The changes will mean a ban for all crypto related ads. According to the Bank of Korea (BOK), South Korea’s central bank, cryptocurrency markets do not pose a threat to traditional markets. The bank made this statement based on the data received from domestic banks in the country. According to the data, the outstanding balance of cryptocurrencies in banking accounts amounted to 2 trillion won (~$1.79 billion).